Sometimes brushing and flossing aren’t enough, especially when it comes to those hard-to-reach areas. 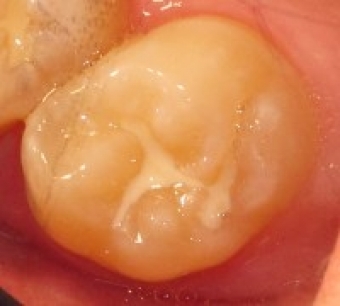 That's where dental sealants and preventative resins come in. It is impossible for your toothbrush to get into the small cracks and grooves on your teeth. If left alone, those tiny areas can begin to decay. Sealants give your teeth extra protection against decay. Dental sealants are a flowable resin that bonds and hardens in the deep grooves on your tooth’s surface. When a tooth is sealed, the tiny grooves become smooth and are less likely to harbour plaque. With sealants, brushing your teeth becomes easier and more effective against tooth decay. Sealants are typically applied to children’s teeth after the permanent teeth have just erupted, usually ages 6 and 12, as a way to prevent tooth decay. It is more common to seal permanent teeth rather than baby teeth, but every patient has unique needs, and we recommend sealants on a case-by-case basis. Sealants may not last forever, although it is fairly common to see adults with sealants still intact from their childhood. A dental sealant only provides protection while it is fully intact, so if a sealant comes off or chips, it needs to be re-sealed. Interested in learning more about dental sealants? The Lorne Park Dental team would be glad to answer any of your questions.